Collecting Vinylmation, Disney's line of designer vinyl figures, requires a little bit of crazy. Like most collecting hobbies, it requires the inherent acceptance that colored mounds of plastic are somehow worth twelve dollars or more. They are great pieces of pop art and design, but it's still quite a lot of money for mass produced plastic. Most people collect something, either consciously or unconsciously, so it's definitely something all people share to some extent. However, Disney collectibles seems to inspire new levels of madness. We'll dub this "Vinylmation Mania." 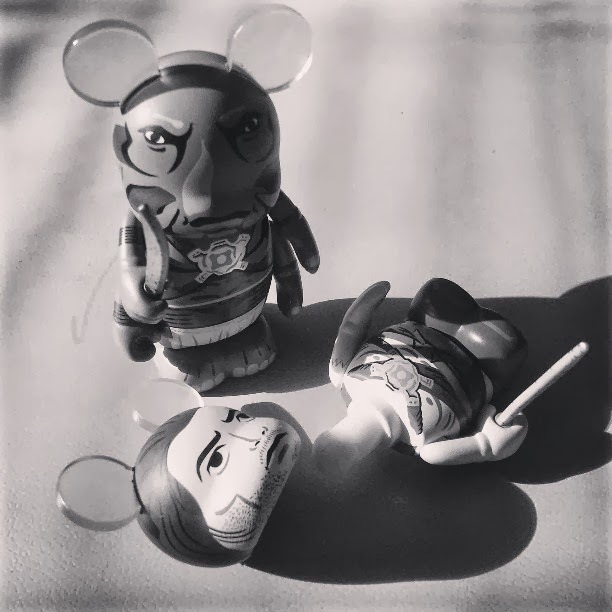 What is the cause of Vinylmation Mania? Maybe it's the effect of inhaling plastic fumes from freshly opened figures one too many times. It could be the rush of blood to the wallet from the brain upon the first sight of overpriced Ebay auctions. Some people might just have taken one too many blows to the head in the melee of a new release buying frenzy. Whatever the reason, some people take the collecting hobby so seriously, they suddenly abandon all human decency. Whether collecting for personal fulfillment or profit, these individuals will do anything to gain an advantage. What follows are some personal observations of this phenomena. I have seen Vinylmation Mania in action, and it is not a pretty sight. Trading with Disney Cast Members originated with pin trading, but also exists in its own form with Vinylmations. 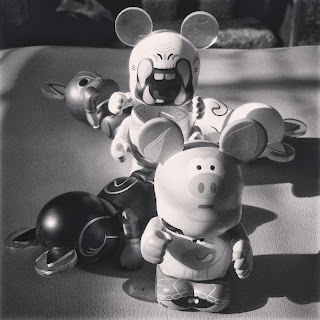 Thus, the earliest examples of Vinylmation Mania can be witnessed in Pin Psychosis. Our exampl subject was a pin trader, and he was also a rather large gentleman. Normally, I would not mention a man's size for the sake of decency and avoiding hypocrisy. However, this person used their size like a weapon. He pushed off the monorail to Magic Kingdom, shoved his way through crowds, and nearly trampled children as he rushed through the park. Was he late for a dining reservation or desperately needing a bathroom? No, this gentleman was pin trading. He ran up to every Cast Member, shoving his way past people also trying to trade, and stared briefly at their lanyards of pins. Unsatisfied with the results, he proffered not a single kind word to those Cast Mmbers as he ran to the next target. I understand the desire to trade with as many people as possible. I also understand trying to make your way quickly through crowds. However, if you're shoving people out of your way and being rude to Cast Members, then you might have Vinylmation Mania. As mentioned, official trading exists for Vinylmations. Unlike pins, vinyl trading is concentrated at select locations around the Disney parks. Usually, these locations provide a small, visible box of Vinylmations, as well as a case of hidden figures each designated one of sixteen numbers. The idea is that even if the visible case has nothing of interest, there's always the possibility of finding some hidden gem in the random box. Of course, people find ways to take advantage of the situation. Most Vinylmation enthusiasts purchase figures at outlet stores and clearance sales to trade in the boxes, even as they bemoan the saturation of inferior trading options. The rules, when followed, allow two trades per person, which lets large families see most of a random box at one time. There's nothing against the rules with these strategies, and they are mostly just attempts to minimize the cost of the hobby. However, some people push Cast Members to break the rules, and children are the best tool for the job. Other than D-Street, where the trading rules are probably etched in stone in the break room, most trading spots will bend the rules for children. They will look for specific items, and even display everything contained inside the random box. Instead of letting their children pick what items they want, some parents use them to get specific Vinylmation for their own collection. Children are given junk vinyls to trade, and are then told they're not allowed to take what they want because they have to get a specific item. Even worse, I've seen someone use this tactic with a supposedly sick friend. They went to trading locations with a list of desired vinyls from a friend back home. Cast Members happily checked for everything on the list, which happened to be entirely composed of rare and expensive vinyls that would most likely end up being on Ebay. 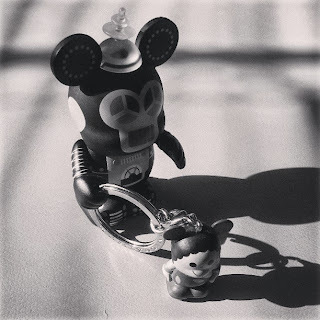 If you find yourself exploiting the young and sick for your own profit, you might be suffering from Vinylmation Mania. Collecting hobbies need a constant influx of new collectors to remain healthy. Disney only produces collectibles as long as they stay profitable, and there are always people growing tired of collecting that need replaced. Creating a welcoming and enjoyable environment is essential to adding more people to the community. Unfortunately, events such as Vinylmation releases and trading nights are hectic situations that generate long lines. These long lines are enough of a detriment to new traders, but the Mania only makes it worse. As lines and waits grow, tempers flare, and the environment becomes hostile. The most common exchange I've witnessed is the "Phantom Line Cutter." Usually, someone meets some friends already in line for an event. These individuals are either not buying anything at a new release, or are temporarily visiting before moving to the back of the line. Either way, they're usually casual collectors at most, and definitely have no intention of line cutting. Nearby people in line don't realize that the line hasn't been breached. Instead of politely asking the person if they're trying to get in line, however, these people suddenly turn monstrous. They huff and puff about rudeness, make passive aggressive comments, then finally angrily demand the person in question get in the back of the line. I've seen near shouting, and have heard of people almost turning violent against these supposed line cutters. Line cutting is terrible, of course, but overreaction and assumptions are not helpful or productive. A kind inquiry will probably have as much effect as aggression, and is far less likely to drive new collectors away from the hobby. 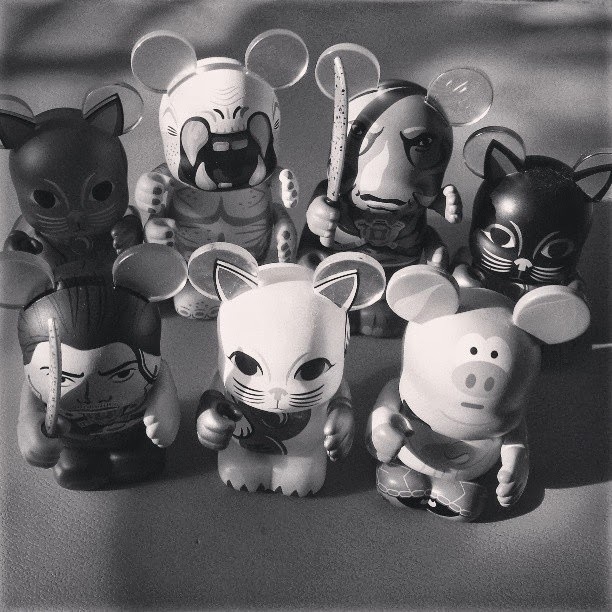 If you've ever nearly punched someone for possibly cutting in line, you might have contracted Vinylmation Mania. Vinylmation Mania is not an incurable condition. It simply takes a realization that you've turned a fun hobby into an obsession or an opportunity for profit at any cost. Realize that at the end of the day, it's all just lumps of plastic staring from your shelves. Enjoy yourself, make a few dollars on Ebay, appreciate the pop art, but don't let the Mania ruin everyone's enjoyment. The tides may have changed regarding kids at D-Street. I've recently noticed that Cast Members are still willing to help but with a vein of reproach, telling the parents that they can't look for specific items or reveal all the contents. They will rescind a trade if a kid was unhappy with their mystery box find, but will still mildly chide the parent(s) because 'they're suppose to follow the rules'. D-Street is the one location that follows the rules, it seems. Sadly doesn't mean much for the quality of trading most of the time, but it helps.